If you love good, flavoursome food and strong fruity cocktails that are on offer almost all day every day then Turtle Bay is the place for you. There are two restaurants in Manchester one in St Peters Square and the other in the Northern Quarter and they’re both amazing! The food is really tasty and every time I go I always think “I should definitely make this when I get home!” as the ingredients themselves aren’t hard to find it’s just the mixture of spices I have never been sure of so, if you fancy a bit of the carribbean in your life then follow the recipe below and you can’t go wrong! There was something really satisfying about making this meal, you’ll be really chuffed with yourself when all the spices come together and develop into that wonderfully aromatic flavour that I just absolutely love. The zestyness of the lime and sweetness of the mango go really well with the jerk seasoning and it’s really simple to do. The brown rice is good source of fibre and protein. This won’t spike your blood sugar like white rice does so you will feel fuller for longer. High levels of antioxidants and vitamin C from the mango giving your skin that healthy glow. The antioxidants fight free radicals in your body so therefore reduces your risk of disease. Avocado is full of healthy fats and is really high in potassium too which helps to reduce high blood pressure. One of the best ways to keep your meals exciting and tasty is to have a good range of herbs and spices in your cupboard. Now I know that may seem obvious but it’s so easy to get into that routine of using 3 or 4 old reliable’s that end up making all your meals taste the same and variety is key to healthy and exciting food! So rather than going out and spending a fortune getting lots of unusual herbs that you don’t know how to pronounce or what they go with, just build up your collection slowly and each time you do a food shop get one new herb or spice that takes your fancy and try it out in a new recipe. Hmm (hint hint) maybe this one? 1 tsp Chilli powder – I use mild as it’s a gentle heat. If you want it to blow your socks off then get medium/hot or just add more! If you haven’t got these you can cheat and buy jerk seasoning, just be wary of potential additives and preservatives. If you’ve got some of the above but not all I think it’s really worth getting the others as they are all spices that can go into so many other dishes. Put the brown rice on to boil in salted water according to the packet instructions. Put all the spices into a bowl and add in the salmon fillets, making sure they are coated all over, season well. Roughly 5 minutes after the rice has been put on, wrap the salmon fillets in tinfoil to make a parcel and put into the oven at 180 c for 15 minutes. (try to make the parcel as airtight as possible so that the salmon will steam in it’s own juice and keep moist). Whilst the salmon is cooking, finely chop the onion and coriander add in the rocket and put into a bowl. Then chop the avocado and mango into little chunks and add into the bowl with the onion and coriander, squeeze the juice of one whole lime and mix well then pop into the fridge. When the salmon is done put the black eyed beans into a bowl with their own water along with the frozen peas and microwave for the amount of time it says on the tin. When the rice is done, drain then add in the black eyed beans and peas and season well with salt and pepper. 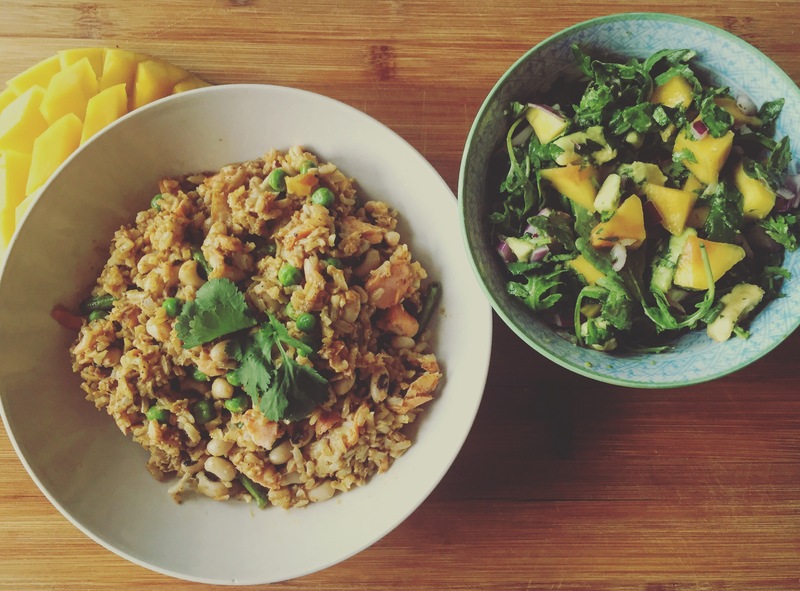 Then flake in the salmon fillets, squeeze over the juice of the other lime, mix well and then serve with the mango salad, a sprinkling of coriander and an optional wedge of lime!